Verb tense indicates the time of an action, condition, or event. 1. Past tense indicates what took place completely in the past. a. The past indicative, like the present, denotes what was habitual. We walked five miles every morning. He was driving furiously when I saw him. i. a duty or obligation, without reference to time. ii. a habit or custom. He would be absent a week at a time. iii. ability possessed in past time. iv. present possibility or power. I could write [now] if I would. If I should write to you [hereafter], you must answer immediately. 2. Present tense indicates present time. a. The present tense is used in expressing a general truth, or what is habitual. The mail arrives at six p.m.
b. If composed of a being verb and the present participle of the principal verb, the present tense expresses what is now occurring. c. The historical present is the present used for the past to describe more vividly what took place in past time. Tacitus describes the manners and customs of the ancient Germans. Matthew traces the descent of Joseph; Luke traces that of Mary. The present of the speaker or hearer is what is meant by present time. The present of the reader may not be the same as that of the writer. d. When preceded by a relative pronoun, or by conjunctive adverbs of time, the present tense is sometimes future in its reference. He will please all who meet him. The flowers will bloom when spring comes. 3. Future tense expresses what will take place in future time. a. Shall and will are the signs of the future tense. I shall make a million dollars. I shall leave at noon. I will go; no power on earth can prevent me. The cause will raise up armies. You will feel better tomorrow. b. Shall, in the first person, and will, in the second and third, are usually used to show future. We shall arrive there by noon. You will be glad to see us. He will be with us. c. Will is used, in the first person, to denote determination; and shall, in the second and third, to denote necessity. I will not do it, come what may. Neither he nor you shall go without me. B. The relative tenses are the present perfect, the past perfect, and the future perfect. The action is shown as completed (or perfected). 1. Past perfect tense represents an act as ended or completed at or before a certain past time. The cars had started before we reached the depot. a. The past is frequently used instead of the past perfect to denote the completion of an act at or before a certain past time mentioned. The boat left before midnight. b. The past perfect subjunctive and past perfect potential deny the action or event. If I had started sooner, I would have overtaken you. 2. 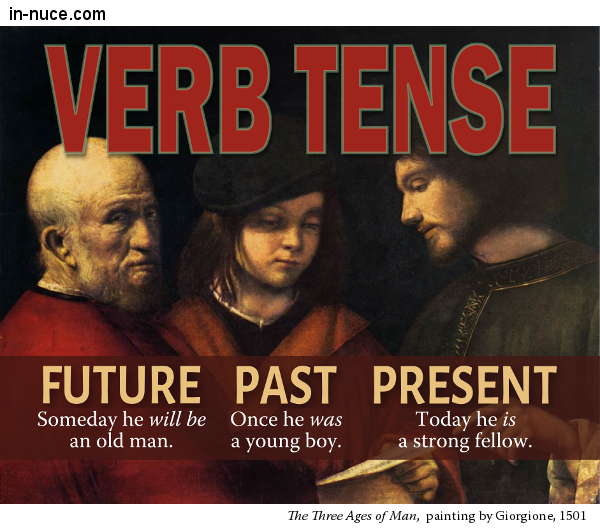 Present perfect tense represents an action or event as past, but connected with present time. a. “Have”, the sign of the present perfect tense, originally denoted possession. It retains this meaning when used as a principal verb. As an auxiliary (helping verb), it denotes completion. The hunters have killed a wolf. A man has fallen from the bridge. b. When preceded by a subordinate connective of time, the present perfect tense sometimes denotes future time. He will forward the goods as soon as he has received them. 3. Future perfect tense represents an action as finished or ended at or before a certain future time. I shall have finished my task at three o’clock. We shall have dined before you arrive.